Wagner would, of course, take up the editorial duties after Page's last volume, the seventh, and continue till his premature and unfortunate (and foreseen) death; it was only a few years ago that I learned that Page had, in the '70s, worked for TV Guide, as I did till the recentish dismemberment of that organization (my usual joke involves a misquotation of Julius Caesar--TVG, actually unlike Gaul, is now in four parts). Page's four annual volumes had followed DAW Books's reprints, rather haphazard, of two volumes of a British annual split into three annual books...and while the DAW series died with Wagner, we currently still have two annuals, those of Stephen Jones and Ellen Datlow, which continue the tradition [actually, now three, with Paula Guran's entry]. But this great read, along with with the First World Fantasy Awards and "Hitchcock" volumes I've already cited (and the interstitial material in Ellison's and Asimov's anthologies and collections) helped draw my to the point where I'd be participating in such fannish projects as Patti Abbott's FFB, of which further examples can be found at her blog. Forge volume, The World’s Finest Mystery and Crime Stories (with the great Thomas Canty sinister watercolor cover painting). 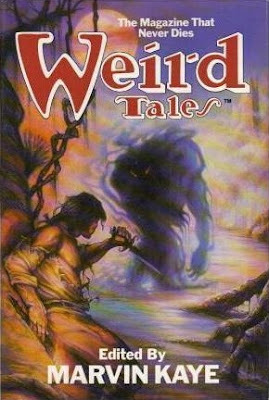 So, this is about as forgotten a book in fantasy-fiction publishing as has ever been released by a major publisher in the field, featuring good (but largely unreprinted) stories by major writers (and a few solid minor writers) in the field, from a magazine that suffered several strikes against it (but largely not artistically, it having published much rather more popular work). Edited by Thomas Dardis, who is credited nowhere on the package (and might well never have edited another book--he was the editor in chief at Berkley Books at the time), the book is misattributed in some places to the magazine Beyond's editor H. L. Gold, a brilliant fantasist in his own right and the clangorous editor of Galaxy, the most influential sf magazine of the 1950s, the stablemate of Beyond. 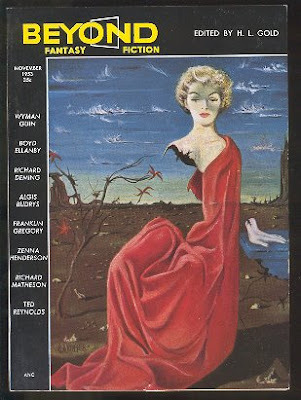 The fantasy magazine, which was issued beginning in 1953, and was retitled from Beyond Fantasy Fiction to Beyond Fiction in 1955 without notable change in content, was hobbled by the financial reverses the Galaxy Publishing Company had suffered--in its very creation, GP Co. had less resources than the international combine, World Editions/Edizioni Mundiale, that had launched Galaxy among several less successful US ventures, and sold the sf magazine to its printer and shut down their US operations. 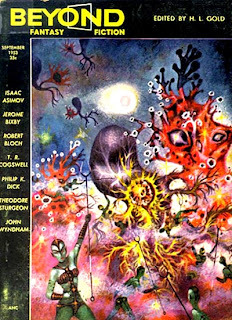 Also, the success of Galaxy had inspired a number of other magazine publishers to try their luck with sf magazines, and sf and fantasy saw more titles flooding the newsstands, at a time when magazine distribution was already becoming a chancier proposition, than ever before or since. Most of these new fiction titles were decentish, but leaning toward the indifferent; some were terrible...which meant any new one, even the sibling of Galaxy, had little chance to distinguish itself, and by the end of the decade most of the magazines had folded. 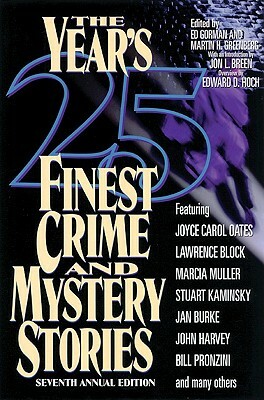 Despite an average quality as good as any of the best fiction magazines in the decade, Beyond folded in 1955, leaving a legacy of largely brilliant longer fiction, often rather notional shorter fiction, and an unusually large percentage of stories with a sort of simmering sexuality that dared not express itself directly, particularly in the early issues. 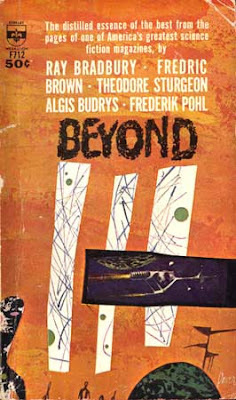 So, eight years later, this anthology, plastered with the claim that Beyond was a great sf magazine, which it was not (like its great model, Unknown Fantasy Fiction, it publshed a fair amount of borderly science fantasy, but not as a majority of its content), and with a decent but unspectacular Richard Powers cover and a clumsy grouping of contributors' names. And its a good, reasoably reprsentative slice of the magazine, leading off with a rather precious Bradbury and wrapping up with a good if unspectacular Sturgeon (not only Bradbury's first great model but also probably the most important contributor to the magazine, much as he was probably the greatest setter of the tone and feel for Unknown in the previous decade, and featuring some of the relatively rare fantasies of Frederik Pohl and Algis Budrys, both much better knwon for their sf, and both vitally important to Galaxy in various ways (even if Budrys was publishing more in nearly every other major sf magazine of the 1950s); the other Gold-magazine stalwarts James Gunn and Wyman Guin (Guin would publish little with any other editor), and such old fantasy hands as Jerome Bixby and Fredric Brown (with two fun if slight vignettes, one of his several specialties). 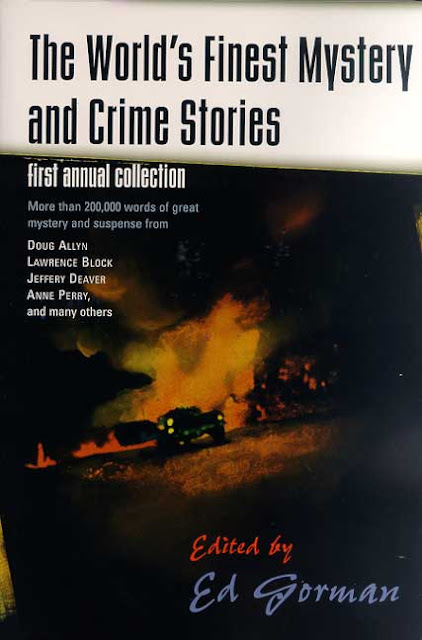 A good if unextraordinary book, and still, I think, the only anthology drawn exclusively fromBeyond's inventory, which is criminal in and of itself. But, then, Fantastic's nearly thirty years of publishing is represented by two only slightly less obscure volumes, and they only slightly better representative of its best work. 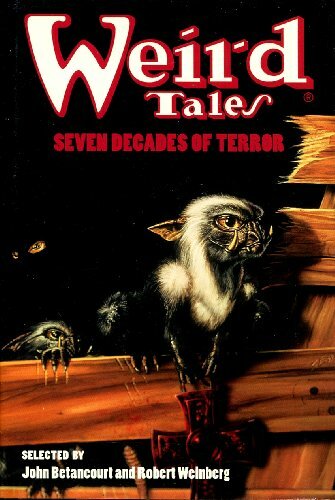 Please see Patti Abbott's blog for more of today's and previous weeks' "forgotten" books. At left, perhaps the ugliest cover of any anthology drawn from Amazing's fiction contents, although none of the anthologies has been particularly famous for its cover. Howard Browne had been editor during a brief attempt by ZD to budget its fiction magazines up to the standards of their other magazines, which had paid off rather well for the third issue of Fantastic, Fall 1953, featuring a story attributed to Mickey Spillane at the height of his popularity (it had been ghosted, out of desperation, by Browne when Spillane had described his actual contribution in detail, and apparently Not a Good One though this was less important, in advance in a profile in Life magazine, also at or near the height of its popularity, the profile published as the Fantastic issue was being put to bed (this issue of Fantastic might still be the best-selling single issue of any fantasy or sf magazine so far, estimated at about 300,000 copies sold). Amazing's somewhat less successful ploy for reaching a mass audience was a story attributed to gossip-mongers Jack Lait and Lee Mortimer, well-known at the time for such paperbacks as New York Confidential, entitled "Mars Confidential"--clearly a joke, but not a successful one. 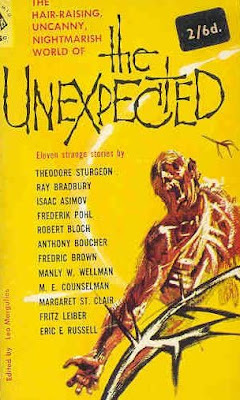 Browne (editor from the late '40s to the early mid '50s, when he formally tossed it to Fairman), had succeeded Amazing's most controversial editor, Ray Palmer, who mixed decent (and less decent) adventure fiction with nut-cult material, had hoped to make a big break from those years--most of the stories from Palmer's years reprinted in the books detailed above are by Robert Bloch, the most talented at sf of Palmer's stable, which also included such natural crime-fiction talents as William McGivern. (Palmer was perhaps the single most energetic proponent in magazine publishing of the notion that "flying saucers" were the spacecraft of alien visitors, and ran a number of pieces in his magazines from a somewhat delusional Richard Shaver, who believed humanity was imperfectly controlled by Lemurians who lived within the hollow Earth...Palmer, after leaving ZD, founded several magazines including the durable "mysticism" and fringe-topic digest Fate). Asimov sold his first story to Palmer, as well, and it unsurprisingly was collected in the above. Amazing: 60 Years... not only sports a hideous cover, but also is set in the format that game publisher TSR put the magazine in during its early years of publication (giving the interior of the magazine, and the book, a rather drab look when illustrations are not present...the book includes a rather odd selection of issue covers, not all but most from the issues the stories come from). TSR probably kept the magazine (barely) alive, and even rather lavishly produced in its later years at the company, in large part due to Steven Spielberg's purchase of "media" rights and renting the title for his rather unimpressive anthology series, with ran on NBC television in the US in the mid 1980s (the magazine's covers trumpeted the connection for the two seasons Spielberg had been guaranteed by NBC). George Scithers, late of Isaac Asimov's Science Fiction Magazine and soon to move on to revive Weird Tales with his partners, produced a magazine not too different fromIASFM, albeit with a bit more fantasy content (Fantastic had been absorbed by its older partner shortly before TSR's purchase) and better nonfiction-historical content about the sf field, and blessedly less of Barry Longyear's dire imitation-Jack Vance "Momus" stories which had plagued the latter years of the Scithers Asimov's. 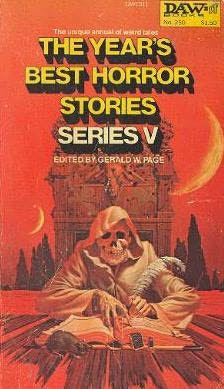 The Greenberg/Asimov book doesn't completely slight fiction from Ted White's editorship, during the decade of issues dated from 1969 to 1979, when the magazine's budget was ridiculously small (its publisher, Sol Cohen, treated it as a retirement job, not unlike the 1970s run of that other old pulp hand Leo Margulies as publisher of Mike Shayne Mystery Magazine and its shortlived companions). White nonetheless was able to publish an interesting mix of the traditionalist and avant-garde work, with somewhat firmer grounding in the field than Goldsmith/Lalli had had, and much as his immediate predecessors, Harry Harrison and Barry Malzberg, had also done while trying to move the magazine away from being largely devoted to reprints (but both Harrison and Malzberg chose to stay with the underbudgeted magazines for only a matter of months--White, living in an inherited house and capable of handling art direction and layout as well as editorial tasks, was able to make a longer go of barely being paid for his efforts). What's good about it: It's a typically entertaining (for editor Peter Haining) slice through the history of the original magazine, and features facsimile pages reprints, and an attempt to give the flavor of what reading the magazine itself was like. What's less good: A weakness or a strength or both, depending on how one looks at it (and also typical of Haining anthologies): it avoids the chestnuts for less-often reprinted work from the magazine, and thus is less representative than it could and perhaps should be. What's good about it: Another fine anthology mining mostly (but by no means entirely) under-reprinted and overlooked work from the magazine. 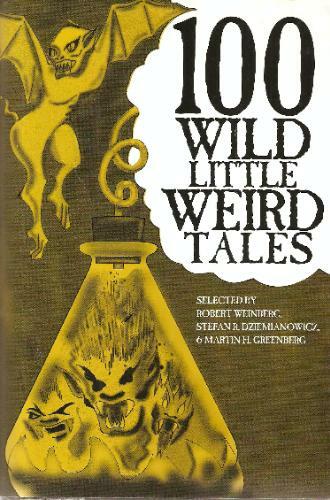 Not quite facsimile reprinting, but the original illustrations are often included. The average quality of the fiction here perhaps just a skosh better than in the Haining. What's less good: The same problem applies...not as representative of the magazine as it could be, by avoiding the popular classics as much as possible. Though that is definitely less of a problem here. What's good about it (and less so): Bang for your buck, certainly, even though if by its nature emphasizes the shorter stories from the magazine. As a result, of course, it slights a Lot of the best work from the magazine, but is part of a series of short short story and vignette anthologies from its editors and publisher, and is (if I remember correctly) the only one where all the contents were taken from one magazine (including some reprints that magazine offered in its issues). Rather bad cover. 127 • The Death Mist • (1932) • shortstory by Captain George H. Daugherty, Jr.
What's good about it: The earliest of the WT retrospectives to make an effort to include examples from the various revivals of the title, post-1954; a nice, fat collection of (as with most) a preponderance of less-well-known work. What's less good: Avoiding the classics does tend to misrepresent the magazine, or in this case magazines (and a periodical book series). What's less so: ...but does so mostly by slighting the earlier versions of the magazine in favor of the 1990s revival. Again, an attempt to collect less familiar work, or in this case sweeten the pot of a best-of the most recent revival (a little less than half the book is from the most recent version), leaves a rather incomplete picture of the magazine and its legacy. 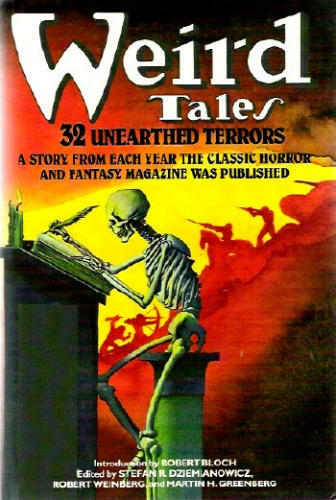 Margulies, of course, had purchased the WT inventory and rights from Short Stories, Inc., after the latter's 1954 collapse (Margulies continued publication of Short Stories magazine till the end of the 1950s), and briefly published a Weird Tales magazine revival in 1973-74, with Moskowitz as editor (Margulies had more sustained success with Mike Shayne Mystery Magazine, which he published from 1956 up till his death in the latter 1970s (it lasted for several more years in other hands), and his other projects in the post-pulp era included Satellite Science Fiction in the latter '50s, The Man from U*N*C*L*E Magazine [and The Girl...] during the TV series' runs, a revival of Zane Grey Western Magazine around the turn of the 1970s, and Charlie Chan Mystery Magazine in the early '70s). Mary Elizabeth Counselman and particularly Margaret St. Clair have been entirely too overlooked in recent years, as have, to a lesser extent, Eric Frank Russell and Anthony Boucher, though at least as a critic and fan of crime fiction, Boucher is in print and memorialized by the annual world convention. 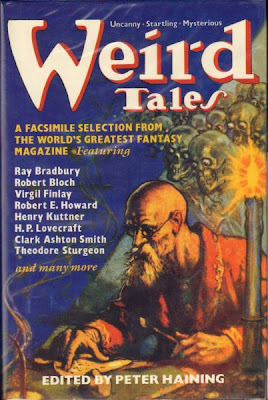 Of the four, Counselman didn't publish much fiction outside of WT...while St. Clair was able to get almost naked horror into Galaxy magazine at its early '50s first peak. John Campbell used the excuse of a Russell novella to found his fantasy magazine, Unknown, which had a fruitful interplay with McIlwraith's WT. And, of course, Bloch and Bradbury were the hottest stars of McIlwraith's WT, here represented by insufficiently representative stories, but they'll do. See if you can find a copy, perhaps without the shillings and pence sticker...it shouldn't be be too hard. 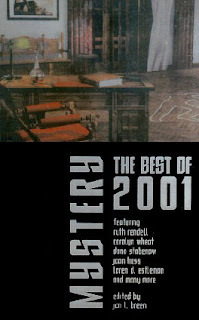 Also notable, the greater eclecticism of the Foley sources (for which she was criticized by some reviewers/carpers...note the major pulp magazine Adventure is represented, as is the literate digest Ellery Queen's Mystery Magazine, and a mix of slick (largely women's when not gender-neutral "intellectual") and little magazines. Bordon Deal went on to write some memorable crime fiction, though his Tomorrow story probably wasn't one. Botteghe Oscure was a semiannual little magazine published and mostly edited by Marguerite Caetani from 1948-1960 from the street Botteghe Oscure ("dark shops" or "dark bodegas") in Rome. 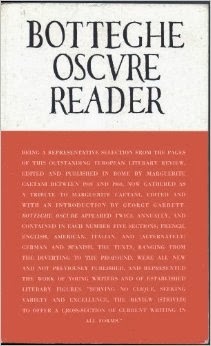 It was very well-funded by her, and while it favored poetry also ran some interesting prose, not least in other languages, as each issue by design featured new writing in English, French, and Italian in discrete segments, followed in alternating issues by either Spanish or German sections, and a scattering of translations from ancient languages and others. Apparently most though not all the materials had English translations, but sadly for me this volume doesn't feature translations of the foreign-language texts (with the exceptions of the Char poetry, where the translations were the new component in that issue), so the French and German are mostly only a little better than Greek to me, since I can guess at the cognates in a Roman alphabet (I can stagger through the Spanish and take stabs at the Italian). It published 25 issues, plus a number of supplements, and the most famous piece of work in English it introduced is almost certainly Dylan Thomas's "Do Not Go Gentle Into That Good Night." Included, of course. Well, having cleverly erased my several paragraphs about this fine anthology, taken from the major little magazine which flourished from 1948-1960 and was published semi-annually and generally edited by the passionate and well-heeled Marguerite Caetani, I will attempt to reconstruct my entry tomorrow, when I get a chance. One thing I made a point of mentioning--along with an impressive array of the best writers in English, Spanish, Italian, French and German, among other languages, but those five regularly, this is the magazine that first gave the world Dylan Thomas's "Do Not Go Gentle Into That Good Night"--naturally, among the works included here. And Caetani paid her contributors well...at a time when Harper's Bazaar might pay a poet $75 a poem, and such less-endowed magazines as The New Yorker or The Atlantic Monthly some fraction of that, she was known to offer $300 out of pocket to the likes of Marianne Moore or William Stafford or Walter de la Mare or ee cummings or Wallace Stevens or such prose contributors as Elizabeth Bowen and Robert Graves. For more Forgotten books, see Patti Nase Abbott's blog, where she sparks and organizes this weekly adventure (three cheers! ).